Orioles closer Zach Britton in action with the Frederick Keys on June 30, 2017, at Nymeo Field. Photo by Austin McFadden/The Commuter. After talking about the anxiety induced from his first trip to the disabled list since May 2014, Zach Britton fixed a smile and shifted down memory lane. 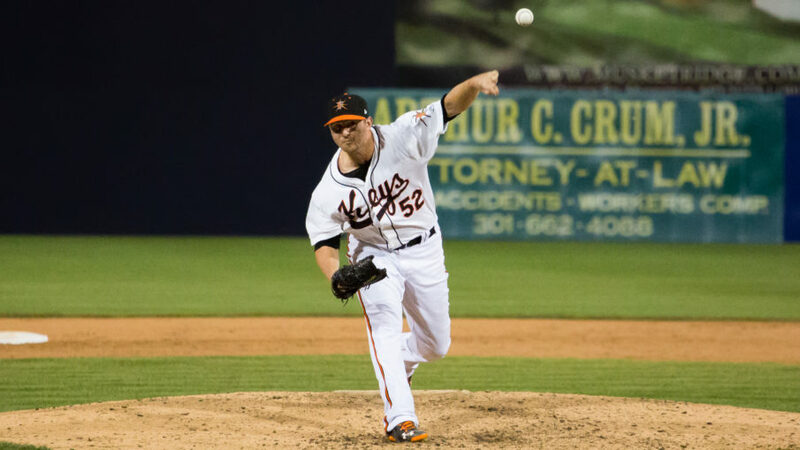 The last time the Orioles All-Star closer played for the Frederick Keys was 2009, back when the left-hander was still a starter. His catcher that season — when he won the Carolina League Pitcher of the Year with a 9-6 record and 2.70 ERA — was Caleb Joseph, who is now catching for Britton at the major league level. And before he logged his first appearance in Frederick in eight years and eighth rehab assignment on the road back to Baltimore, he chatted with Lynchburg Hillcats first base coach Kyle Hudson in between innings, also a former teammate of Britton. When the time came for Britton to pitch his usual ninth inning in front of the 7,928 fans who filled Nymeo Field, he breezed through the frame in 1-2-3 fashion, needing 11 pitches to do so. The Keys lost 5-0, and despite not being put in a high-leverage situation, Britton got through an important checkpoint on the rehab journey. Britton has been on the disabled list since May 6 with a left forearm strain. On Thursday, Britton threw a scoreless eighth inning for Double-A Bowie, striking out two while throwing eight of his 14 pitches for strikes. In eight rehab appearances, he’s thrown 7 2/3 innings, allowing two runs (2.35 ERA) and five hits. Britton fell behind 2-1 to the Hillcats’ No. 3 hitter Sicnarf Loopstok, but then painted the outside with a fastball to draw the count to 2-2 before inducing a 5-3 groundout with his signature 96 MPH sinker. During the next at-bat against Connor Marshall, Britton fell behind 1-0, but on the second pitch, he manufactured a 6-3 groundout with a curveball. Britton worked the count to 1-2 on Martin Cervenka before deploying a curveball that swooped over the plate for the swinging strikeout. Roughly 95 percent of Britton’s pitches in the big leagues are sinker or fastball, so in situations like this, it’s appropriate to bolster confidence with his curveball. Britton plans to throw his ninth and final rehab game with Triple-A Norfolk on Monday and if all is well, should return to the Baltimore bullpen next week. It’s also Britton bobblehead day in Baltimore when the Orioles take on the Rays at 1:35 P.M. Obviously, Britton isn’t available to pitch, but he said he’ll be on site for the giveaway. “Bad timing; bad timing on my part,” Britton said, laughing in the process. Lynchburg put up three runs in the top of the second to take a 3-0 lead, and then added another in the third and eighth to make it 4-0 and 5-0. Starter Ofelky Peralta lasted three innings, allowing five hits, five walks and four earned runs. Peralta also struck out three and falls to 1-7 on the season. Orioles’ 2016 first-round draft pick Ryan Mountcastle provided the only extra base hit with a double.